It’s six seconds of footage virtually everyone with a reliable internet connection has seen dozens of times. A West Yorkshire teenager with a red “New York” T-shirt sits in a stationary vehicle and addresses the camera directly. “I’m in my mum’s car,” she says, as if she’s getting away with something diabolical. She punctuates this half-boast, half-confession with a memorable bit of onomatopoeia, apparently meant to represent the sound of a revving car engine: “Broom, broom.” Cut to the girl’s mother, trying to appear stern but clearly giddy to be part of the video. “Get out me car!” she shouts. Cut back to the girl, sighing with disappointment: “Awwww!” This little vignette of short-lived adolescent rebellion caught the internet’s attention in a huge way when Tish Simmonds first posted it to her Vine account on July 21, 2014. Millions upon millions of views ensued, as did countless parodies and remixes. 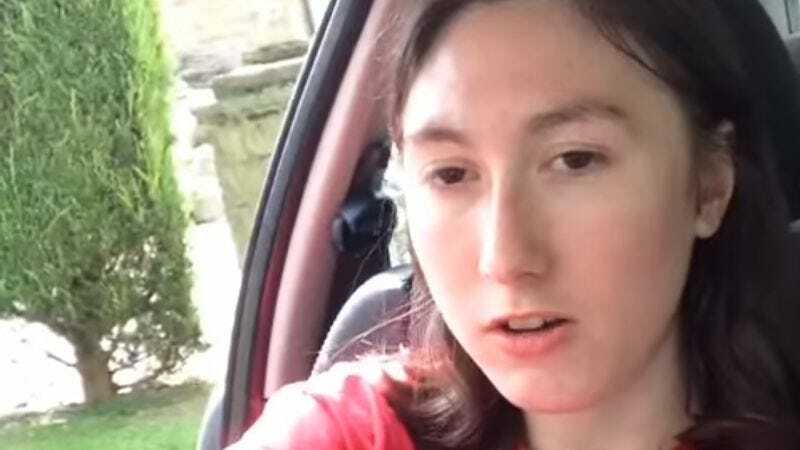 Now, as the “broom, broom” phenomenon turns two, Jezebel’s Madeleine Davies reflects on the viral video, its impact on viewers, and the ineffable charm of Simmonds herself. The mood of the tweets is celebratory, so Simmonds has seemingly come to peace with her viral fame. As one might guess, the notoriety of the video had a downside as well, and Simmonds found herself the target of online bullying. Happily, though, she now appears to embrace the legacy of “broom, broom.” That’s good to know, since the video inspired so many delightful remakes and offshoots, maybe the most famous of which combines the Vine with “Take On Me” by A-Ha.